Why do a 7 round mock? Is it slideshow format per B/R's rules or something? Bookmark this link. It "deslides" stuff like that. Why is AJ Trapasso so down on a fellow Buckeye, Ward? Nice article Dan. 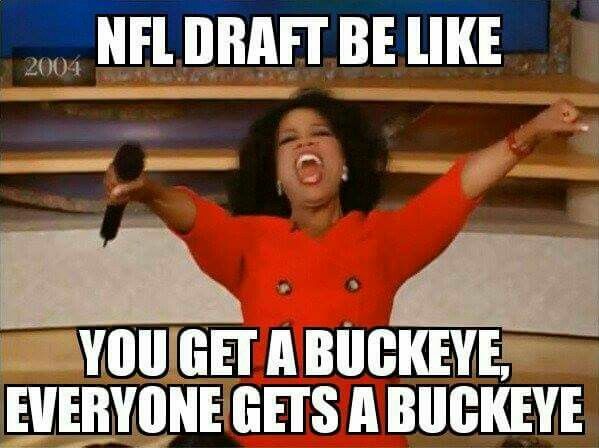 Do you have any info on which teams interviewed Buckeyes? Every one of them that was asked said they had interviewed (either formally or informally) with more teams than not. It typically isn't worth reading into which players teams met with at the combine because they try to at least set up an informal interview with as many players as possible. Wow, Baker didnt do himself any favors with his 2017 season. He was once projected as a first-round pick. Maybe he shouldnt have waited until the final 3 games to start playing well. It's articles like this one that makes me stop in my tracks and realize how spoiled we are as fans to have this site and staff. Such great, comprehensive coverage of all things Buckeyes. Would love for the Bengals to nab either Jones or Baker in the 2nd or 3rd round, respectively. They won't because they are allergic but I'd be stoked if they did. I would dance naked in streets if the Lions got Ward at 20. I'm holding you to that if it happens. Great article. I looked at Bleacher Report when it came out and was not a 100 click slide show.